Pupils are taught in spacious and well-equipped classrooms by extremely dedicated and ambitious teachers. We place huge emphasis on the growth mindset, and you will find reminders of how we encourage pupils to think for themselves, learn how to learn and to equip themselves with both 21st century ICT and traditional methods of learning in all classrooms and learning spaces. We have a total of 60 laptops for use in the classrooms and 30 iPads, all of which are constantly in use from Year R upwards. All of the classrooms have up to date SMART boards and the school uses MyMaths and other learning platforms to enhance the learning experience both in and out of school. Our classrooms are bright, airy and full of excitement. The Old Town Hall campus is steeped in history and its traditional features should be treasured and preserved. It is wonderful that buildings like this one can continue to be a rich and valuable part of our community’s heritage and provide a first class teaching base for the next generation. 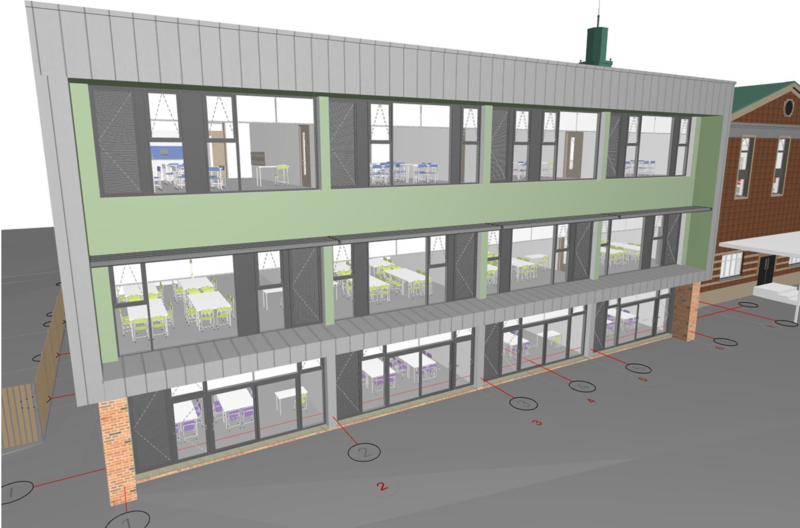 The three-floor steel frame extension will include 15 new classrooms, a library, a kitchen and a sports hall. Construction is scheduled for completion ready for the 2017-18 academic year.